Home » Blogs » 7GenGames » We Want Your Ideas. We REALLY want your ideas! We Want Your Ideas. We REALLY want your ideas! The code applies to all individual user single or multi-game purchases of Forgotten Trail, Spirit Lake and Fish Lake. If you are one of those wonderful souls who have been following our game development journey since Spirit Lake you’ll know what a long way we have come. If you’ve only come on board recently you’re about to see changes. I know it’s popular to say BIG CHANGES, DISRUPTIVE CHANGES, THE HUGEST CHANGES EVER! What you’ll really see is small changes that add up to huge ones. 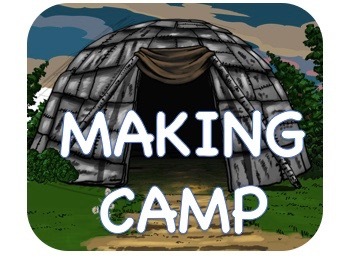 If you saw the Making Camp demo last month, this month you’ll see a demo with somewhat better questions, a native iPad app version and an Android app. Because we’re developing for each device, the games will look better. Next month, we’ll have a paid app where you can save your game and save your wigwam and everything in it. You’ll still be able to play the demo version for free. So, what does that have to do with you? WHEN SOMEONE ASKS YOUR OPINION ON A FINISHED GAME, THEY DON’T REALLY WANT YOUR OPINION, THEY WANT YOUR APPROVAL. The way to make great games is to start with people playing games that are not so great and ask their ideas on how to get better. A tribal elder speaking about Native American Essential Understandings. A rabbit judge at the junior livestock show at the Johnson County Fair. Two middle school teachers who reviewed our games and made recommendations for the educational content. Five children aged 8-12 years old who played our games and gave me ideas for what they’d like to see in the next one. Two counsellors who work with youth who gave advice on game design. Four parents who talked to me about what they thought would keep their children playing the games more. Because we really mean it, any game you buy between now and July 31 for yourself will be 90% off. Use the discount code JULY90. This is only for individual licenses because we want to learn from you and get the benefit of your ideas. Yes, that is the 50 cents for Forgotten Trail or a measly buck for Spirit Lake or Fish Lake. All games can be played on Mac or Windows computers. Why not free? That is a whole different blog post I’ll get to later, but if you really don’t have 50 cents or the time to input your credit card, you can still play our Making Camp demo for free here. Making Camp runs on in a browser on Chromebook, Mac, Windows, iOS and Android. We’ll have an iPad app and Android app up within a few weeks. You can still donate a game to a school or child for the same price of $4.99 for Forgotten Trail or $9.99 for Spirit Lake or Fish Lake.